CHICAGO - Through a new report issued by the Association of College and Research Libraries (ACRL), “Academic Library Impact on Student Learning and Success: Findings from Assessment in Action Team Projects,” the higher education community now has compelling assessment findings that tell a strong story about the multiple ways that academic libraries are contributing to student learning and success. The report focuses on projects completed during the third and final year as part of the program Assessment in Action: Academic Libraries and Student Success (AiA) from April 2015 to June 2016. Teams from more than 50 campuses completed assessment projects and reported on them individually (fully searchable online), and this synthesis builds on past findings from an additional 150 projects completed during the first and second years of the AiA program as context. Students benefit from library instruction in their initial coursework. Information literacy instruction provided to students during their initial coursework helps them perform better in their courses than students who do not. Library use increases student success. Students who used the library the library in some way (e.g., circulation, library instruction session attendance, online database access, study room use, interlibrary loan) achieved higher levels of academic success (e.g., GPA, course grades, retention) than students who did not use the library. Collaborative academic programs and services involving the library enhance student learning. Academic library partnerships with other campus units, such as the writing center, academic enrichment, and speech lab, yield positive benefits for students (e.g., higher grades, academic confidence, retention). Information literacy instruction strengthens general education outcomes. Library instruction improves students’ achievement of institutional core competencies and general education outcomes such as inquiry-based and problem-solving learning, including effective identification and use of information, critical thinking, ethical reasoning, and civic engagement. Library research consultations boost student learning. One-on-one or small-group reference and research assistance with a librarian enhances academic success, as documented by such factors as student confidence, GPAs, and improved achievement on course assignments. While these project findings may not be generalizable, as from some forms of social science research, they can be adapted to other settings with care and consideration to local context. Because the findings are derived from action research, which is situated in authentic institutional contexts, the results reflect “on the ground” practices in terms of resources available and campus priorities. Use of library space relates positively to student learning and success. Beyond the findings about library impact, librarian team leaders reflected on the experience of leading a collaborative campus team. Librarians engaged in an immersive process of ongoing interaction with one another and collaboration with their team members. 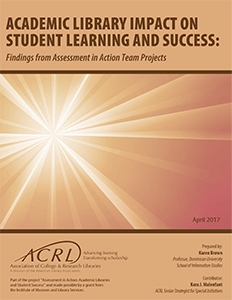 Read more in the full report “Academic Library Impact on Student Learning and Success: Findings from Assessment in Action Team Projects.” The executive summary is available as a separate document, formatted to share broadly with campus stakeholders. The three-year AiA program, funded by the Institute of Museum and Library Services (IMLS), helped more than 200 postsecondary institutions of all types create partnerships at their institution to promote library leadership and engagement in campus-wide assessment. Each participating institution established a team with a lead librarian and at least two colleagues from other campus units. Team members frequently included teaching faculty and administrators from such departments as the assessment office, institutional research, the writing center, academic technology, and student affairs. Over a 14-month period, the librarians led their campus teams in the development and implementation of a project that aims to contribute to assessment activities at their institution. A new day-long traveling ACRL workshop builds on the AiA curriculum with a focus on strategic and sustainable assessment. Learn more about how to bring this and other ACRL licensed workshops to your institution, chapter or consortia. A forthcoming print volume, "Shaping the Campus Conversation on Student Learning and Experience: Activating the Results of Assessment in Action," will describe the entire AiA program in greater detail. The volume, to be published by ACRL in fall 2017, will provide context, offer reflections from team leaders, and serve as a culminating capstone for the three year IMLS-funded program.